This kit includes the custom pneumatic opener integrated with track, *Liftmaster MyQ wireless controls, 100 feet of air tubing, 12 VDC control box, 12 VDC power supply, compressor fitting, and mounting hardware. 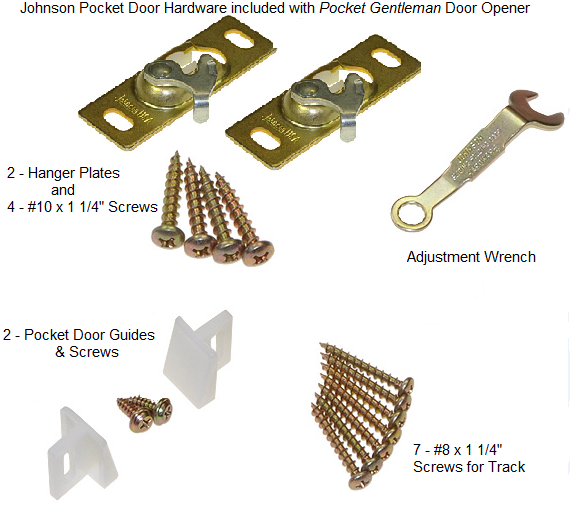 Pocket Door hardware includes HD ball bearing hangers rated for a 200 lb. door. Please call with special requests for your installation or questions. Air compressor not included, order separately if needed. Click an option below for pricing. Please note: If choosing Pocket Door with Rest Room Interface, also order Rest Room System - it will not work without it. Also, the Rest Room System includes Auto-Reverse, Timer or Positive Control, & Hold-Open features. The Pocket Gentleman is a pneumatic system designed to power a pocket door. The new construction/renovation kit is hidden in the wall and includes the track and hangers for the pocket door. The control system powers the door and is able to sense an obstacle and relax pressure automatically, making for safe operation. The optional Auto Return feature is NEW and will automatically re-open the door when it encounters an obstacle! The pneumatic tubing and the remote system are all plug and play. There is no need to hire an electrician, but you may need a handyman to install the Pocket Gentleman. You receive a wireless remote system or you may adapt to your existing system. It only takes a simple switch to interface with the Pocket Gentleman! You will need a source of compressed air to operate the Pocket Gentleman. Although quiet models are desired, many customers locate the air compressor in a garage or basement up to 125 feet away. If you already have a source of compressed air, you may use it to power the Pocket Gentleman. Additional tubing and connectors are available, please call. 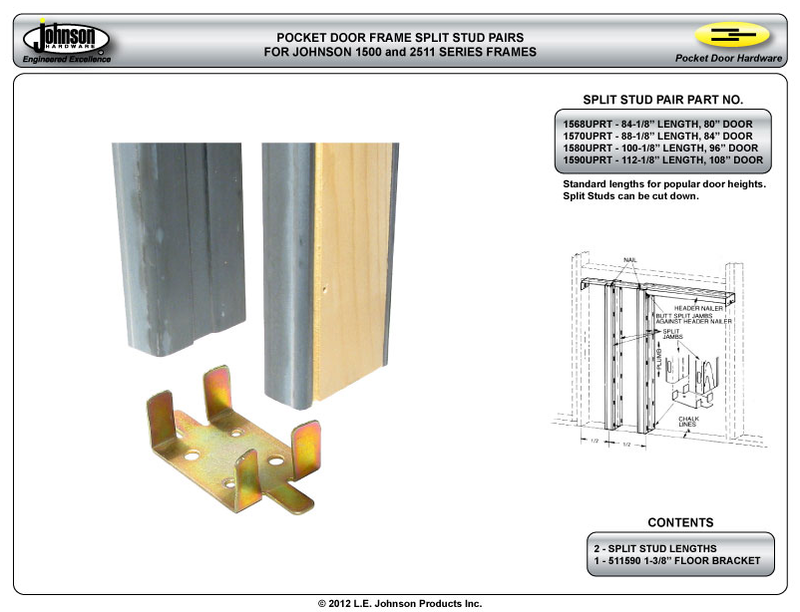 Although we recommend a 2 x 6 wall for this kit, it will fit a 2 x 4 wall but you will need to create additional space for the operator. A minimum clearance of 3 1/4" is required within the wall for the Pocket Gentleman. Using Metal wrapped studs available from L.E. Johnson is an option to allow for more room. Also, add a total of 5" to the overall rough opening width, see instructions. *NOTE: Openings larger than 42" utilize rodless cylinders and do not include the track, the installer must adapt the operator to the door during installation. Check out the details on Gentleman Rodless Operator page. Please call if you have any questions 800-525-7078. Automatic pocket doors provide the easiest passage for wheelchairs, walkers, and scooters! Imagine your friends entering your home entertainment room, man cave, or secret room through an automatic pocket door!